European legislation relating to textile dyeing; Environmental legislation USA; Toxicology of textile dyes; Environmentally responsible application of textile dyes; Supercritical fluid textile dyeing technology; Pollution abatement and waste minimisation in textile dyeing; Decolourisation of textile dye effluent and re-use of spent dyebath; Chemical treatment of textile dye effluent; Biotechnological treatment of textile dye effluent. Textile dyes enhance our environment, bringing colour into our lives. The current range of dyes have been developed to withstand environmental effects, such as degradation by exposure to light and water. However, the industry involved with the application of dyes to textiles has a responsibility to ensure that potential for harm to the environment, for example through residues in waste-streams, and to the consumer is minimised. Written by an international team of contributors, this collection reviews current legislation and key technologies which make textile dyeing more efficient and environmentally friendly. The book begins by detailing European and US legislation relating to textile dyeing. 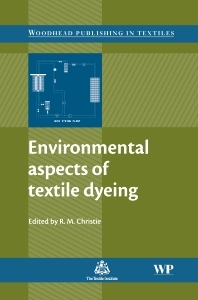 Further chapters cover toxicology, environmentally responsible application of dyes and supercritical fluid textile dyeing. The book concludes with chapters on the reduction of pollution and minimisation of waste, the re-use of spent dyebath, chemical treatment of dye effluent and biotechnological treatment of dye effluent. Environmental aspects of textile dyeing is a standard reference source for manufacturers concerned with developing a sustainable industry. Dr R. M. Christie is Reader in Colour Chemistry in the School of Textiles & Design at Heriot-Watt University, UK. Dr Christie is internationally known for his work on colour chemistry, and organic pigments in particular.